I struggled a little to write this article. With the end of the season just days away, a winners/losers roundup didn’t really seem appropriate. Instead, here I’ll try and tackle a few questions/discussion topics that must surely be on the mind of many as the playoffs approach. Will a Canadian team finally do well? Canada is a country filled with many hockey loving people, that is not a cliche. However, for such a passionate country, the cup drought as been painful. The last Canadian team to win was the Montreal Canadiens back in 1993. No Canadian team has even made the finals since Vancouver did it in 2011 (I was VERY okay with that loss). This year, it’s a virtual lock that 5 teams will make the playoffs, the – Oilers, Flames, Canadiens, Senators and (shockingly) Leafs. Only the Canucks and Jets will fail to make it this year, which is pretty amazing. Is this the year the drought is broken? All of the teams, save for Montreal, lack the depth of of say the Capitals or Blackhawks, but in hockey anything can happen. Especially this late in the year. Next week we’ll dive into predictions on how I think all of this will play out. Will Washington break the President’s Trophy Curse? As mentioned in a previous article, a team finishing the season with the most points is most definitely NOT a guarantee of Stanley Cup win. If there was ever a team to break this curse though, it’s the Capitals. Although it’s not a lock yet, based on games left, it’s a solid inference that the Capitals will win the trophy this year. The team just looks incredibly solid as the end of the season approaches. Holtby is superb, the team is 8-1-1 in their last 10 games. Ovechkin is scoring, Oshie scored a hat trick a few games ago, and everything just looks really good in Washington at the moment. Will this momentum continue through the playoffs? One can only hope, it’s time Ovechkin got that illusive cup. Will a team other than Chicago or Pittsburgh win? This is my personal greatest wish for this season. Since 2009 the Penguins have won 2 cups, the Blackhawks have won 3 cups and the Kings have won 2. With the Kings out of contention this year, it would be nice to see someone else get to the top this year. Unfortunately, the Penguins and Hawks look extremely strong again this season, so it’s definitely a strong possibility that one or both teams will make it to the finals. Here’s hoping a team comes out of left field (the Senators maybe?) to shock the league and win that cup! 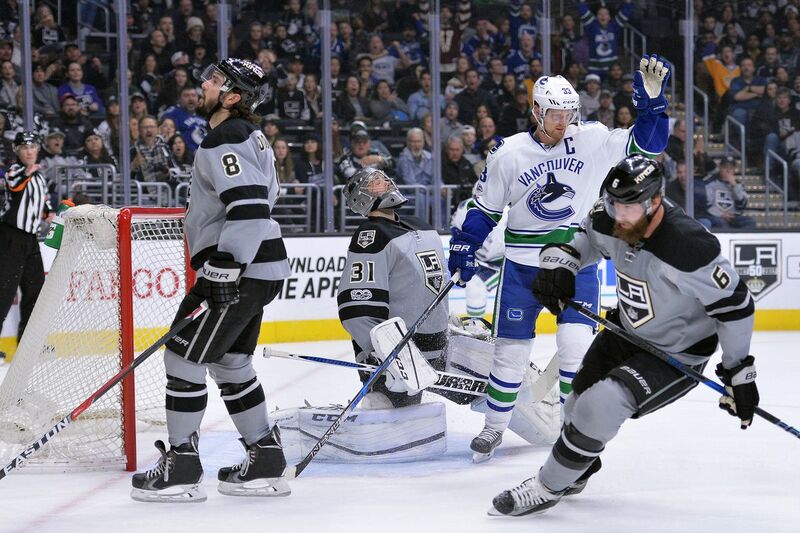 What will the Los Angeles Kings do in the offseason? For a team to go from winning the cup in 2014 to not making the playoffs in 2017 is going to hurt. Had Darryl Sutter not signed a contract extension in 2016, one would assume his job would be on the line for sure. However, he is likely safe for this season, but many players are not. Captain Anze Kpitar had an underwhelming season. New goalie Ben Bishop has not been the rock solid back for Quick that they had been hoping. Add this to acquisition of a few key players just before the trade deadline, one has to wonder just how much cap space the Kings are going to have in the off season. It will be interesting to keep an eye on the news, to see what moves the team makes in order to try and get back in contention for 2018. What will become of the no NHL players in the Olympics mess? As I was writing this, news broke that the NHL will not compete in the 2018 Olympics in Pyeongchang, South Korea. This decision is going to prove to be incredibly controversial. From the prospective of (the most hated man in the NHL) Gary Bettman, he makes the valid points that the downtime costs NHL owners money and creates a weird gap in the schedule. This is true. However, when you’ve got top tier players who want to play for their home countries, how are you going to say no? Alexander Ovechkin has been very vocal in saying he wants to play for Russia no matter the outcome. So the question that lingers now is – will players be allowed to play on a case-by-case basis? Or are all players banned? Keep an eye on this news over the next little while, it’s going to get heated. Will the Boston Bruins break my heart in (or before) the playoffs? The answer is yes. Unequivocally yes. Stay tuned next week when I attempt to bring you my playoff predictions!